At the top is the Parthenon with the Greek flag, phoenix rising above. Winged victory at right extending an olive branch. 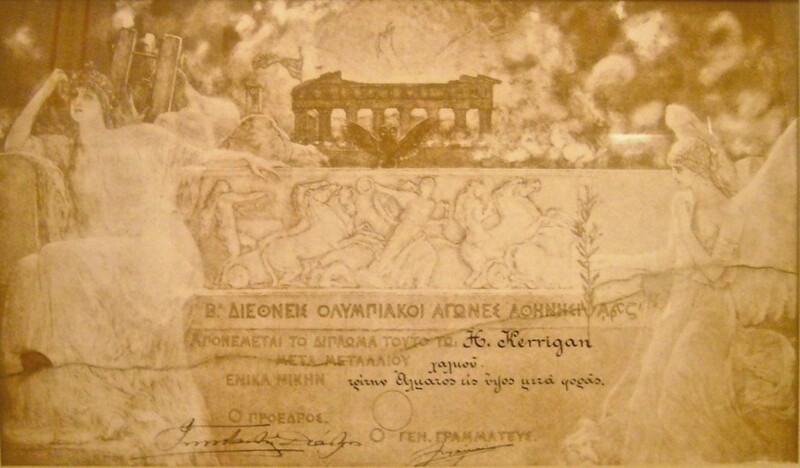 Hellas seated at left, relief of the ancient Olympic Games in center. C. Leahy (Ireland), Great Britain, first; height, 1.775 meters (5ft. 9 7-8in.). H.W. Kerrigan and T.H. Diakidis, third; height, 1.725 meters (5ft. 7 7-8in.). 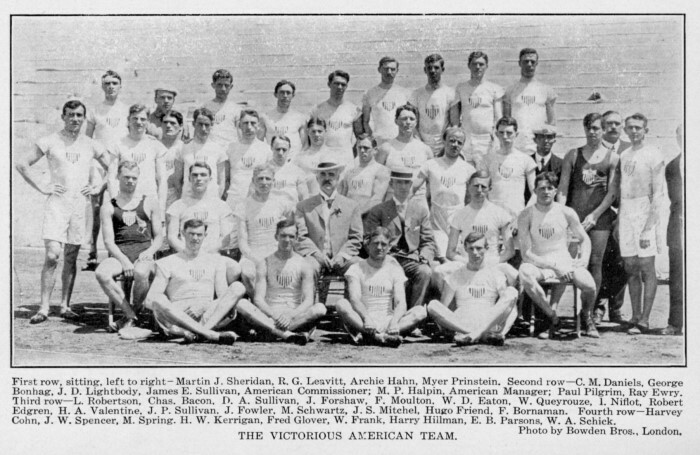 The above performances were made on Tuesday, the competition stopping on Monday on account of darkness, at 1.675 meters, with the following men left: C. Leahy, Ireland; G. Runstrom, Sweden; T.H. 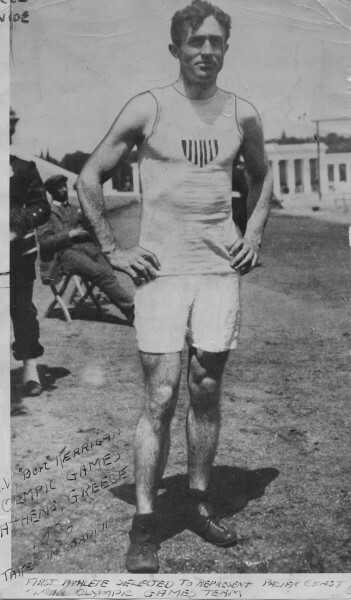 Diakidis, Greece: Goenczy, Hungary; H.W. Kerrigan, America. The running high jump furnished somewhat of a surprise. It was confidently expected that Kerrigan of America would push Leahy. Kerrigan, however, owing to the Barbarossa accident, was inches behind his true form, and that he got as good as third surprised those who knew the condition of the man, for he was anything but well. The jumping of the different contestants here proved conclusively that outside of Kerrigan and Leahy, the others knew none of the fine points of high jumping. The Greek and the Hungarian who figured in the high jump, jumped purely with strength - with no science - and did remarkably well. One of the contestants who cleared 1.75 took off at least 10 feet or more from the bar, and who in making his qualifying jump slipped at least eighteen inches, having no spikes in his shoes. Such jumping is simply remarkable unter such conditions. It only goes to show what these foreigners will do when they take up scientific jumping.